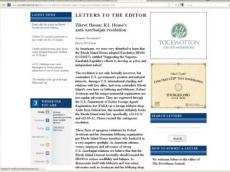 Zikret Hasan, a Portsmouth resident, sent a letter to The Providence Journal this week criticizing the R.I. House of Representatives’ resolution. “The resolution is not only factually incorrect, but contradicts U.S. government’s position and national interests, damages U.S. international standing and relations with key allies, and even contradicts Rhode Island’s own laws on lobbying and lobbyists,” he wrote. “The U.S. Azeris Network is ready to meet with the General Assembly representatives and staff to brief them and testify on the Armenia-occupied Nagorno-Karabakh region of Azerbaijan, as well as to debate any Armenian lobbyist or lobbying organization that masterminded the H8180,” the letter reads. Last Thursday, the R.I. House of Representatives unanimously passed a resolution “supporting the Nagorno-Karabakh Republic’s efforts to develop as a free and independent nation.” House Speaker Gordon Fox himself was the lead sponsor and 33 Democrats and Republicans seconded the motion; nobody objected.